October 2010 Special- Get delighted dear patrons. New lot of eye clean, treatment free, deep purple African Amethyst acquired today. Total of 704 carats, eyen clean, calibrated Amethyst. Welcome to the world of Natural treatment free gemstones. Lovely deep purple color, eye clean, calibrated and top jewellery grade Amethyst from Africa. This lot is currently under certification and will be uploaded soon. 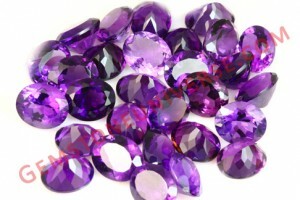 Amethyst is a superior alternative to Blue Sapphire the gemstone of Saturn. Go for a top grade amethyst and finally upgrade to a Blue Sapphire! Community Initiative by Gemstoneuniverse and Astromandir! An opportunity given by God to serve his elderly subjects who have been abandoned by their kith and kin and we feel blessed! On 18th September 2010 during the holy Ganesha festival , Gemstoneuniverse and Astromandir was given an opportunity to be a part of the social services rendered by Aashraya Seva Trust and Kadamba Friends Association to serve the almighty’s elderly subjects. 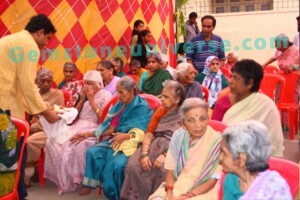 “Aashraya’ a home for the aged was started for the purpose of serving aged women in the fag-end of their lives that have been abandoned by their kith and kin. This Home was visualized as a residence with a homely atmosphere so that the senior Citizen’s would be not feel up- rooted from the surroundings to which they were accustomed to and to fill their remaining years with much better comfort, care and attention. The team at Gemstoneuniverse.com and Astromandir feel blessed that in the IT city of Bangalore that houses several corporate bigwigs we were given the divine opportunity of Annadana-the divine gift of donating grain and serving the elderly. 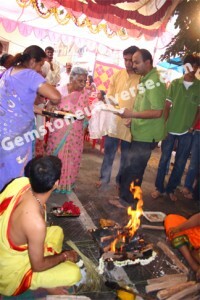 As a part of the programme a divine Ganpathi Homa was performed where we prayed for these elderly family members of ours and also for all our patrons at Gemstoneuniverse.com and Astromandir. It was a moving experience! These marvellous sensual beauties were mined from a rough from the famed gem field of Marapana-Ceylon. The whole lot yielded a net total of 42 carats of unheated and fully natural Blue Sapphires totally 11 in number. 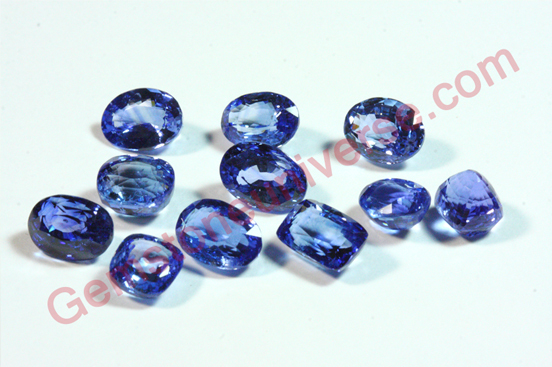 The effort was worthwhile because the color and lustre of these lovely blue sapphires just take your breath away. Each unheated Blue Sapphire of this lot is unheated, fully natural, eye clean and flawless. Masterfully crafted into perfect ovals, cushions and rectangles this is an amazing lot. Absolutely top Jyotish quality and guaranteed to deliver the best results for Lord Saturn. The color ranges from deep Royal Blue to Silky Kashmir blue. Grab these beauties from our rough Lot Number 1073. The classification, certification and appraisal is over and these will be listed anytime this week. Things we don’t like and you shouldn’t either- The Coral-Red/White that you are wearing might just be a Camel Bone or plastic and has no Jyotish Value. Scam watch alert. Cases leading to failure of Gemstone therapy! In recent times we have come across Corals both white and red those are not corals at all. These are sold on various auctions websites and some astrology websites and we actually paid to procure them to unearth this sham. Corals are actually the skeletal remains of a marine polyp. The fleshy skin polyps secrete a carbonic substance from which Coral grows like branches and trees in the warm waters of the ocean at a depth ranging from 10 feet to 500 feet. Around 95% of the Coral is made up of Calcium Carbonate, around 3 % of magnesium carbonate and trace elements of iron. There is heavy demand for organic Red Coral from Japan as it has the characteristic Bright Red Uniform color often referred to as the Mediterranean Ox Blood Color as this is much desired. Recently, we found out that some unethical elements are buying Camel Bone, bleaching it to make it pure white and then dyeing it with Red Dye and finally wax filling it and coating it to produce Red Coral Simulants that are being sold as Red Corals to unsuspecting public. These are priced anywhere from $2(INR 90) per carat $20(around INR 1000) per carat. Please be aware that these are not Red Corals at all leave alone organic red Corals produced in the sea and have no Jyotish Value and will not deliver the planetary results of Mars. When we contacted many of the sellers on the auction website to ask about the organic nature of the Coral and why it was priced so low- We received Zero, yes Zero replies from the seller. How to differentiate Real Organic Japanese Red Coral from a Fake One! The answer lies in the nature. Generally the Ventral/Top side of the Coral is highly polished and is free from any marks or indentations. However the dorsal side/back side of the Japanese Red Coral has the characteristic tell tale wood grain effect– line/lines-white or brown in color, groove pits and striations. Featured here in this picture is a fine Japanese Red Coral from our collection of fine Natural Planetary Gemstones and Talismans that has both the Ventral and Dorsal Views that will make the marks of nature quite clear. If the dorsal side of the Coral is virtually free from any marks you can be assured 99% of the time that it is not a natural Coral! Please ensure that when purchasing a Red Coral the certificate should read Natural Organic Red Coral. 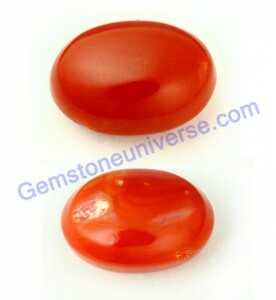 What is a Jyotish Quality Coral? – Fully Natural and organic. Precious Biogenic material! – Created in the sea by marine polyp. – Be free from any dyeing or wax filling. – Should have even color. – AND SHOULD NOT BE A CAMEL BONE OR PLASTIC. We remain dedicated to the sacred art of planetary Gemology and our patrons. Patrons interested in entry level Jyotish Quality Gemstones should contact us directly with their requirements. At the very outset we would like to clarify that the Planetary Gemstones featured on our blog as rings and pendants have already been shipped out. This is quite clear because we mention the patron location, price among other details related to the Gemstone. This can be verified in our testimonial section wherein some gracious patrons have written about their experience at Gemstoneuniverse.com. Still we receive some mails from patrons who want the same pice that has already been shipped out! After some of the entry level Jyotish Gemstones were featured on the blog there have been a lot of enquiries from patrons worldwide. If you have seen some pictures of our inventory here on the blog as well on our Facebook page you would know that we carry huge amounts of inventory. It is just not possible for us to list the whole inventory because of several reasons on the website. Even though the gemstones on our website are reasonably priced ( Yes 1/6th of retail), and we bring in tremendous value with certification, appraisal and buyback we understand that for some patrons even this price is out of reach and they would be interested in still lesser priced gemstones. Please do your research. We stand by our claim. We would also like to point out that Description, taking the photograph of the gemstones and uploading other relevant details takes around 2 hours for one gem! It’s not possible for us to list entry level Jyotish Gemstones on the website. Meanwhile what is an entry level Jyotish Gemstone? – The gem has to be fully natural. – The gem has to be fully treatment free. – The gem should have a minimum clarity level of 75% and above. – The gem should be able to provide the planetary energies of the planet it is intended for. 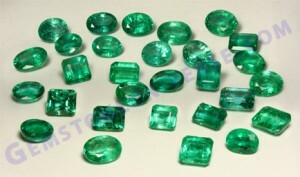 When we procure gemstones or cut individual pieces all the gemstones are not equal. They vary on the 4C’s of cut, clarity, color and carat weight. Whatever we feel is exceptional is already on the website. But still there are gemstones which qualify on the criteria of the above 4 parameters of the entry level Jyotish Gemstone definition. 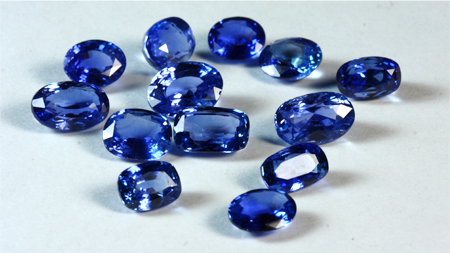 Interested in 2+ carat Blue Sapphire in approximate price range of $500-$700. Once we have understood your specific requirement we will search our inventory for something suitable and get back to you. If you evince interest we will ask you to make a deposit of around $50 which is fully refundable but acts as a security that we are not moving up a blind alley. 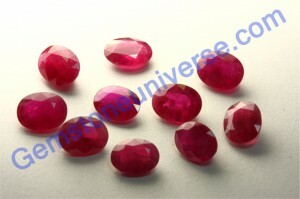 We will send you pictures of 2/3 gemstones that match the criteria and proceed from there. For a demand like this please contact your jeweller and the astrologer who actually made this recommendation. They will make even a 10 carat bluff thermal diffused and glass filled ruby at $10. Don’t be obsessed with weight. Target clarity and lack of treatment. Please do not waste our time. Do your research and then send us a mail. 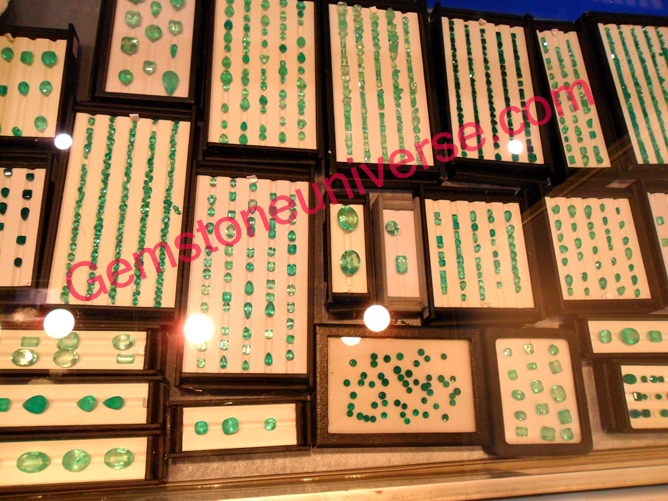 We want to give our best to interested patrons who really want to implement planetary Gemstone therapy properly. After a very long time we have been finally able to procure the much sought after imperial pigeon blood Burma rubies that are fully natural, free from thermal diffusion and not glass filled!. The wait was worth it because each of these rubies is dazzling, full of resplendent natural beauty and the lustre is amazing. These are currently under certification and you can expect to see them in the Ruby inventory anytime next week. Superb Sattvik Sun energies and 100% Jyotish quality Gem. 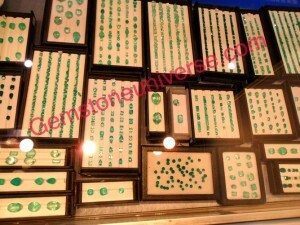 Sneak Peek into Gemstoneuniverse.com- Stunning and Bedazzling gallery of Colombian Emeralds Inventory on Display in fully Glory at the 46th Bangkok Gem and Jewelry Fair from September 7th, 2010 to September 11th, 2010. Come and treat yourself to our part of our inventory of Colombian Emeralds displayed in its full glory in our showcase at the 46th Bangkok Gem and Jewelry Fair from September 7th, 2010 to September 11th, 2010. Rest assured this is one of the best and the largest inventories of Colombian Emeralds painstakingly collected over two decades. Whatever your requirement, budget and need we will fulfil it and continue to delight you! Note: All Images from the show are shot using the camera of the I Phone 3GS as Cameras are not allowed in the show premises. When Did recession start and when did it end- Live report from 46th Bangkok Gems and Jewelry Show- Unheated Lot of Burma Rubies- Lowest Grade starts at $3000 per carat and the Highest Grade at $9000 per carat- Where Will the common man who needs Gem Therapy the most afford these! And those consultants who recommend a 5 carat Ruby to the ignorant buyer should watch their step! It is the 3rd day of the 46th Bangkok Gems and Jewelry Show and this fair evokes mixed feelings. Even though no major deals are happening the prices of natural gemstones are still going higher. This substantiates the fact that Gemstones are the best investment-better than stocks, land, gold or bullion but that story is for later! The Asia Pacific Buying division of Gemstoneuniverse.com is participating in the show and our patrons who are attending the show and those who are in Thailand are welcome to meet us. Coming back to the main subject of this report is this rare lot of Burma Rubies (Please see attached pic). 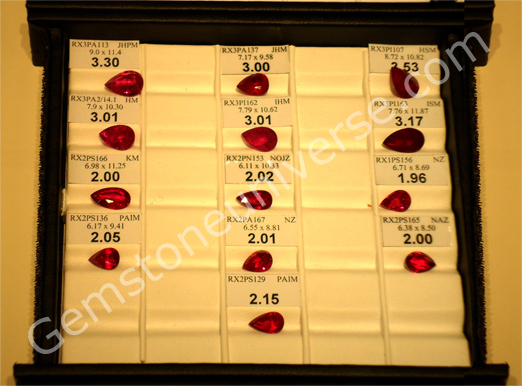 Each one of this pear shaped Imperial Pigeon Blood Burma Rubies has a Gem clarity grade of VV2 or higher. 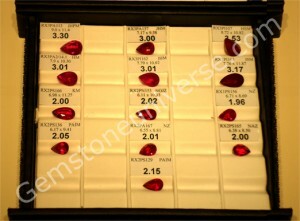 The lowest priced Ruby in this lot is $3000 per carat and the highest one is $9000 per carat. Hence average price of this lot will be roughly around $6000 per carat (INR 3, 00,000 per carat). Think about it dear patrons- When this price is for hard seasoned professionals who have been able to get this price after hectic negotiations where does the normal individual with no background in Gemology stand. Each of these lovely miracles of nature is certified by GRS and the GIA. We receive many calls from patrons who do a lot of research on the internet but have never seen or felt a natural ruby in their hand and when these patrons ask for specifics such as Imperial Pigeon Blood color it becomes so difficult to explain. In addition there are many Astrologers with no knowledge of gemology and no knowledge of the sacred text either who mindlessly give recommendations such as wear a 5 carat Ruby. Here see the truth- it is in front of you. Remember we told you some months back that we procured a small lot of White Sapphires that was totally natural and unheated after 2 years- we meant it. Come to the show yourself and among more than a thousand suppliers get us 1 yes you are reading right 1 White Sapphire that is unheated and untreated and weighs above 2 carats. Same for the Natural Burma ruby, Give us a Burma Ruby that is certified Natural above 2 carats below $3000 per carat and we will buy from you. This report has been written with you in mind. Yes many conclusions come out of this report –Gems as an investment tool and most importantly the future of Natural Unheated Ruby now is Mozambique and Madagascar ruby. Get them while the prices are low. 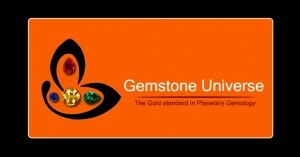 We at Gemstoneuniverse will still continue to work harder for our dear patrons! Many more pictures from our stall and other reports from the show in a couple of days!